Deep in a far corner of Stony Brook University’s South P lot, as commuter students frantically bustled around him, Kevin McEvoy sat alone in his car and prayed to God that he would learn the art that he knew his hands were made for. He remembers his undergraduate days clearly as he works in his studio. The main lights in the room are off so only sunlight peers gently through the windows. The lights above each individual easel illuminate each student’s work. Italian music dances through the room, creating an authentic feeling as McEvoy walks around with his sleeves rolled up to his elbow, observing each student’s work. His tawny brown hair is slightly tousled on top of his head and his warm eyes look over each easel with pride. As an undergraduate student at Stony Brook University, McEvoy felt like he was lost at sea. He was interested in courses the art department offered, but felt like he was made for something different. 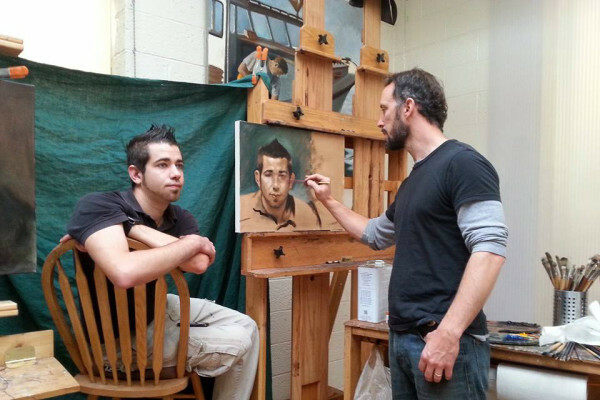 In a representational art class taught by Bill Oberst, McEvoy found a mentor who brought him closer to the art he wanted to do. According to Oberst, McEvoy showed enormous potential, coming to class early and working hours after the class ended. McEvoy packed up his paint brushes and looked for inspiration and guidance elsewhere. He searched Florence block by block in hopes of finding artists open to teaching him the ways of the classical greats. “It was like a Lewis Carol’s ‘Alice in Wonderland’,” McEvoy said. He was greeted by a man who introduced the cathedral as Charles H. Cecil Studios, one of the most elite and prestigious art schools in Italy. The man welcomed him into the cathedral, which was adorned with the most beautiful paintings he had ever seen in his life. “How do I become a part of this school?” McEvoy asked, jaw dropping as he retold the story years later. “You can’t. It’s a four-year waiting list,” the man answered. Everyone there was connected and elite. But McEvoy was determined to become a part of this phenomenon. McEvoy gathered his sketches and set forth to meet the master of this studio, Charles Cecil himself. He was expecting an Italian with no patience for common Americans and was prepared to be let down. McEvoy walked into the master painter Cecil’s studio. Cecil was painting a woman as McEvoy entered the room. She dressed herself and walked off. It turns out, the mysterious Cecil was not a high-brow Italian artist, but actually a guy from Boston, Massachusetts. McEvoy pulled out his drawings and showed him. ‘You know there is a two to four year waiting list to my school,’ he said to McEvoy. ‘You know it is really expensive to get in here. Determined to do anything to delve into this artistic wonderland, McEvoy answered, “I will sweep your entire studio, I will clean bathrooms, I will do everything,” McEvoy said. “I had so many dead ends so to arrive at this moment was incredible,” McEvoy said. His dreams as a young boy on Long Island were finally coming to life in front of his eyes in Italy. Growing up, McEvoy was surrounded by heavy labor, coming from a family that predominantly worked in construction. While the fine arts may seem to be foreign to the world of a manual laborer, McEvoy said it hits close to home with his Irish roots. While his parents were supportive of his pursuing fine arts during his college years, they did not know how to connect his passion to a career. “It looked like somebody shoved an egg into the corner of my hand,” he said, pointing to where his hand had been swollen. For the pain, McEvoy saw a specialist who told him he could never do heavy labor again. Having lived in Central Islip as a kid, McEvoy is no stranger to tough characters. As McEvoy drove past the Riverhead jail on his way to the Hamptons in his adult career, he looked at the building’s walls lined with barbed-wire and wondered how to bring the art he loved to the inside. The people he loves most, his sons, are following in his footsteps and showing great potential in art at a young age. His oldest, an 8-year-old, just began painting. However as much McEvoy loves art, he does not want to impose it on his sons. As for his wife, Margaret, who has been with him through this journey, she says this is not a life she would recommend, but she would not have it any other way. “When people ask me what my husband does and I answer ‘artist,’ they ask, so what does he really do?” Margaret said. Today, McEvoy is the director and president of the Atelier at Flowerfield in St. James, Long Island. The open studio is bustling with students of all ages, from all different walks of life. Stony Brook University Hospital surgeon Vimala Sivararman operates a different set of tools than usual when she enters the studio. With a splinted hand, she holds a stick of charcoal in one hand and her finished drawing of a hand in the other. Sivararman said McEvoy saw the potential she had as an artist and he encouraged her to keep moving forward with her talents. Student James Englebert is a former city cop turned chaplain. He is taking three of McEvoy’s classes right now as he currently tries to find a job. Engelbert accredits his outlook of the world to his movements on the canvas. He describes art as a gateway to something within the subject and within the artist themselves. Today, McEvoy makes sure to say “thank you” to an old friend as his life flies by, remembering the ways that God has helped him. He usually prays in a parked car before heading to work.